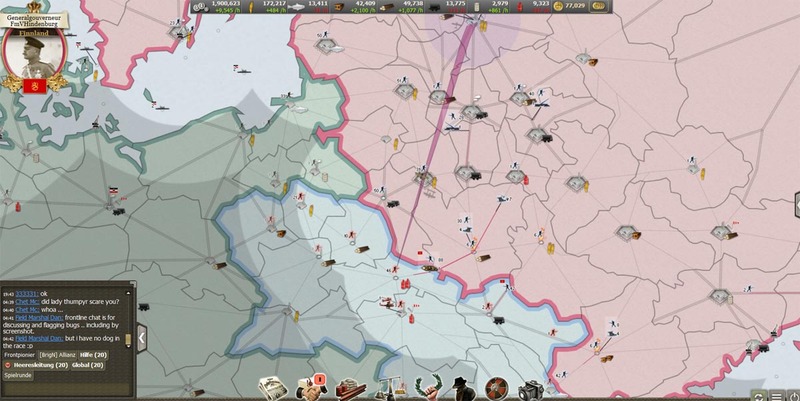 Clear victory with Finland in the game of Supremacy 1914. The outcome of the game Supremacy 1914 played during the last weeks should not be ignored and is hereby reported. 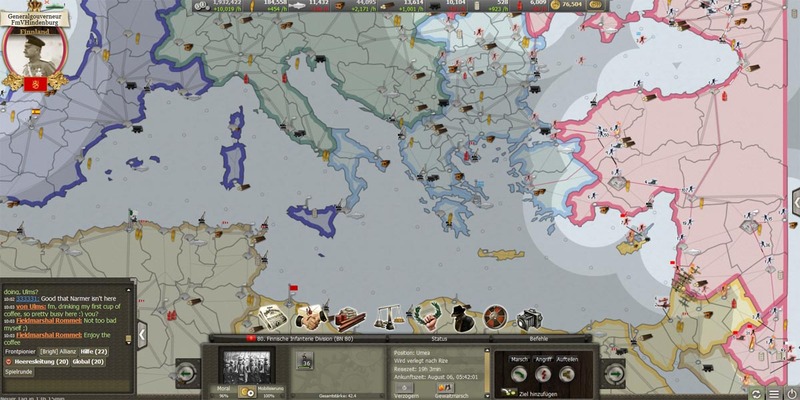 After starting of the game Supremacy 1914 and the interim score of day 37 the long time leading and still very strong player of Greece had given up; probably because Finland succeeded by a clever operation to bring the bulk of the also not longer played Caucasus under control. In addition to the strong Finnish fortifications along the border with Greece and the German Reich, Finland was now also superior by economic and military strength, what was probably the major reason for the opponent for throwing the towel. The Finnish attack (red area, black units) on the now by AI guided Greece (blue area, red units) has begun. After some time of inactivity to wait for a possible return of the player of Greece (which did not take place), our well-prepared attack began on his territory. This was triggered by the attack of Libya in North Africa on the local Greek territory, so that Finland was forced to act. The Finnish attack thus had two spearheads: once in the Balkans and the Middle East. 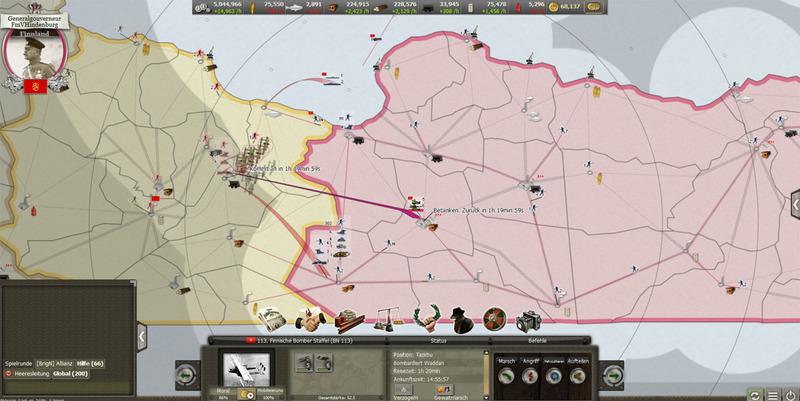 After the Finnish troops were advancing in the Middle East, the ally players from Algeria and Libya have started in the meantime an attack across the Suez Canal and the Red Sea and pushing forward on Greek territory. Since Finland nevertheless was able to bring most of the resource-rich provinces with oil under her control, the two North Africans ally attacked. They had an extremely strong air force, which could quite decimate our troops, which is why the Finnish army retreated to two heavily fortified cities, which blocked the access to Turkey, waiting for massive reinforcements from the north. While the Finnish Forces still have a long way in the Balkans, Algeria and Libya are attacking in the Middle East. The Finnish attack in Macedonia on the Algerian bridgehead (brown). Simultaneously, the Finnish Forces in the Balkans had to still work ahead to numerous Greek AI-controlled troops, while Algerian troops landed in Macedonia; but by a ruthless strip of the northern borders and despite heavy losses against the still strong Greek troops, Finland was able to pull together sufficient forces in the Balkans and in Turkey to reach local superiority by numbers (with infantry) – though not by quality (less artillery and especially airplanes). 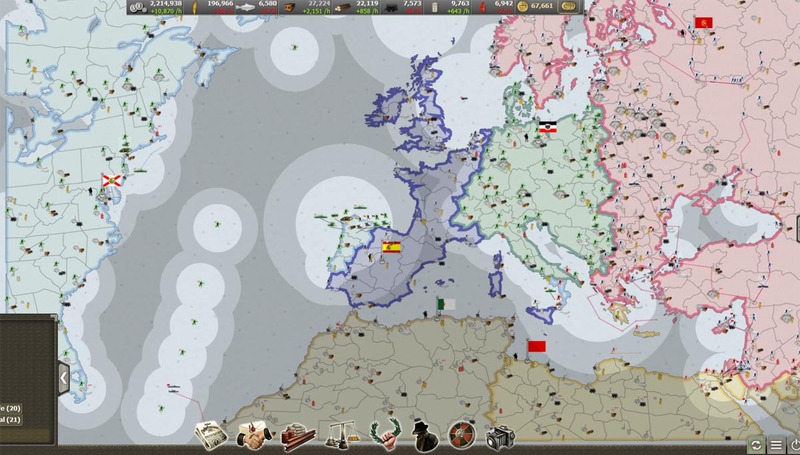 It helped that Germany – with Spain allied – was attacked by the CSA across the Atlantic and therefore showed no attempt to attack our only weakly secure borders in the north. 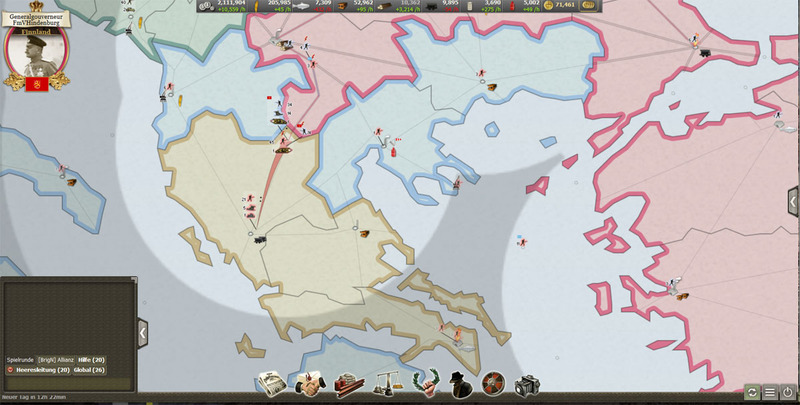 Until day 45 we had the situation so far under control with our reinforcements, that almost the entire Balkans was conquered except the Peloponnese and Crete and our strong infantry army group stood before the Sinai and Arabia, where still strong enemy forces from Algeria and Libya have to be faced. 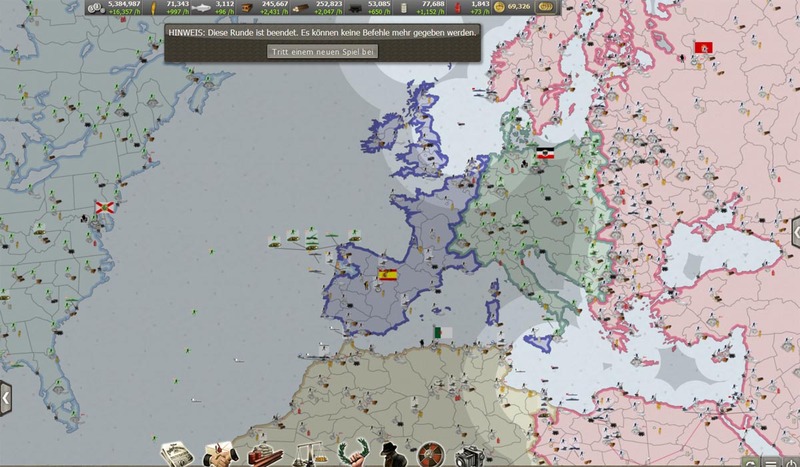 Our ally CSA fought meanwhile in Greenland and the Iberian Peninsula against Spain and Germany. Situation on Day 45: Finland (red) controls almost the entire Balkans and has once again returned to Arabia and Sinai. Finnish final offensive in Libya. After fierce and tight battles in the Sinai Peninsula, which required the latest available Finnish reserves, we succeeded by destroying the opponent east of the Suez Canal and the Red Sea and to control the region. We suggested to the North Africans a truce after our troops reached the Suez Canal, the original Finnish operation goal. This was refused, so we crossed the Suez Canal after bringing in our long-range railway artillery guns and the development of our own, strong air force. The enemy retreated before our railway artillery, against which he could not do anything. The Libyan troops gathered in heavily fortified western part of Libya which by then was also supported by rail guns and some aircraft, while Finland was preparing for the final offensive. Time was also needed because the destroyed railway network had to be expanded to the west, bringing closer the Finnish railway guns into fire range to the targets. Situation at the Finnish final victory on day 64. 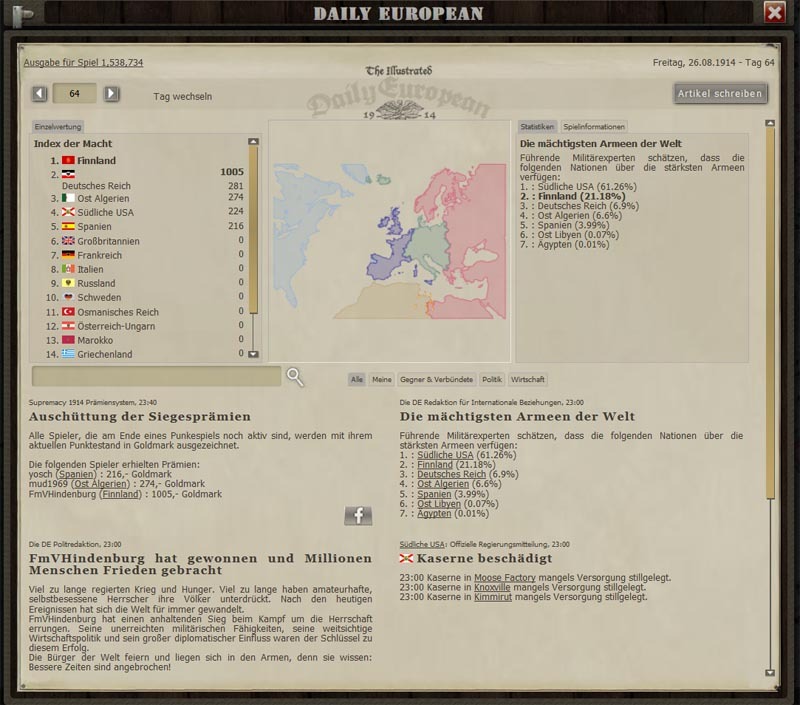 Proclamation of victory in the game newspaper with rankings and points. On day 64 Finland had achieved by the expansion of the previously conquered provinces 1,000 points, which the game was stopped automatically. Our Finland won this game of Supremacy 1914 with 1,005 points, ahead of the German Reich (281 points) and East Algeria (274 points).